BY 109 – Introductory to Biodiversity and Evolution. An introductory course for biology majors. Focus is on evolution, phylogeny, taxonomy, origin and diversity of life, physiology of plant and animal systems, and ecological principles. Three hours of lecture and two hours of laboratory per week. Limited to students who are majors in Biology, Chemistry, Mathematics, Computer Science and Software Engineering. For biology majors and other students needing an introduction to the cellular and molecular levels of biology. Includes an introduction to cell structure and function, biochemistry and metabolism, bioenergetics, genetics and cell division, and molecular biology. Three hours of lecture and two hours of laboratory per week. Limited to majors in Biology, Chemistry, Clinical Science, Medical Laboratory Science, Mathematics, Computer Science, Software Engineering, Criminal Justice, Health Studies, and Health and Physical Education. A seminar course with presentations by guest scientists as well as students. 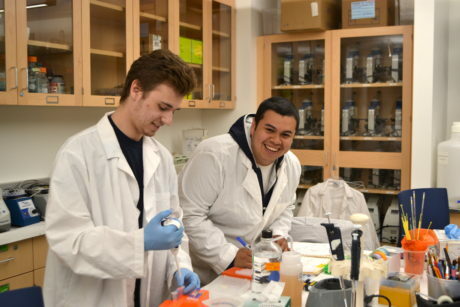 Gauges students’ abilities to draw upon a broad background of coursework and experience to organize, present, discuss, and evaluate topics of current interest in biology. Prerequisite: Senior standing; open only to Biology majors. Synthetic theory of evolution, including sources of genetic variability, Hardy-Weinberg, natural selection, genetic drift, balanced polymorphism, molecular evolution, speciation and the origin of life. Three hours of class per week. Prerequisites: BY-109 and BY-110, both passed with a grade of C- or higher.